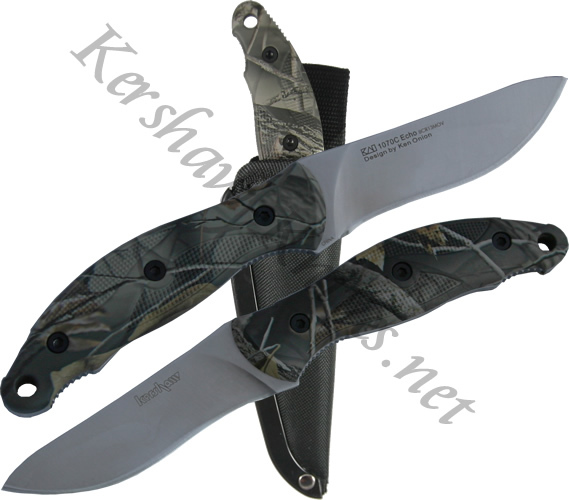 The Kershaw Echo Camo hunting knife has a full tang AUS8A stainless steel blade. Designed by Ken Onion, This knife features a great looking curve on its drop point blade, and a handle that is fatter in the middle. The reason for the fatter handle is so that your hand does not get as tired after heavy, prolonged use of the knife. A Realtree camouflage pattern on the handle of the Kershaw Echo further secures its image as a hunting knife. The sheath is a black nylon sheath.